What is a Wedding DJ, and how are they different? 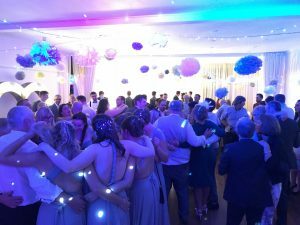 Put simply, the best Wedding DJ is a DJ with experience, skilled with multi genres, and with extensive music knowledge, the ability to be able to change the mood in an instant and work ‘on the fly’. Weddings are our specialist subject and we pride ourselves in offering exacting quality and the very best in wedding DJ entertainment. Being a good wedding DJ is not an easy task, you have to love it for a start, you cannot be the ‘star’, that’s the brides job, and you have to entertain the entire audience….. The average wedding has a guest count of 50-200 people, of all ages and musical tastes, all to entertain at once, it’s no mean feat to get it right. In a club, people are there for the music genre that club offers, at a concert the audience go for the band and it’s musical style, but at a wedding, everyone is there, from toddlers to mum and granny, all enjoy something different and that’s where a skilled, experienced wedding DJ shines over a less experienced DJ, or DJ who specialises in another area. We love a wedding and have DJ’d at many hundreds and according to our Reviews and Testimonials, have hit the spot nicely. Of course, this doesn’t mean being ‘generic’ and playing the same old songs, absolutely not, that’s where we endevour to be different than other wedding DJ’s, we strive to include the songs that others might not, the lost classics, your favourite songs from university, the stuff that defines you as an individual and as a couple. If techno, indie, rock, etc is your thing, we’ll make it happen! The ‘wedding favourites’ have their place and the degree to which they are played is something we discuss with you to plan your night, to make it the perfect entertainment, to make it YOUR day, but equally to please the other audience members who maybe didn’t go ‘raving’ with you, or to that ‘indie club’ you and your college friends frequented! 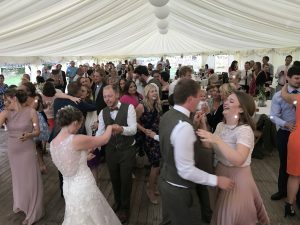 Our job is get the music mix right to make it unique to you, and also to include your guests to ensure they go home with happy faces saying your wedding party was the best ever. The evening entertainment is the single longest part of the day, so needs to be done right, and we’d love to be in charge of that task for you. 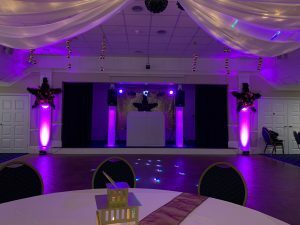 As well as being skilled DJ’s, we love to provide fantastic sound and atmospheric lighting to bring your venue alive. Our prices are competitive for the quality we offer and definitely give great value for your investment. Our white wedding setup looks great in your wedding pictures and will blend in nicely with your decor. You don’t really want your first dance pictures to be in front of a web of wires and ugly equipment! We also offer more traditional ‘disco’ looks for those looking for that style. We love to work with you on the musical styles for the night. We actively encourage you to provide some favourite songs (10-20) to add into the running, to make it special to you. 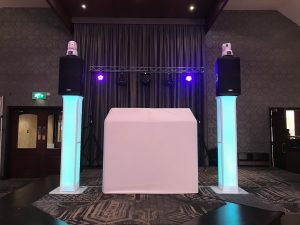 We do not recommend extremely long lists, as these restrict the DJ’s ability to use his skill, and as weddings are always a mix of people and we need to appeal to all. Our DJs are very skilled at these events and will work the room, giving everyone the chance to dance, with a big nod to your favourites. On the night requests are also welcomed. 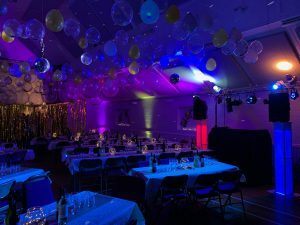 Uplights, Starlit Backdrops, Gobo Projection, all add to the atmosphere and can be found on our Extras page. Also regular suppliers to: Rockbeare Manor, Deer Park Country Hotel, Exeter WOW Group, Livebusiness Group, Renegade Pictures, Great Barn Doddiscombsleigh and many more! We have worked many hundreds of weddings and have met and worked with many suppliers, if you wish to have recommendations on caterers, master of ceremonies, pipers, bands, photographers etc, just ask! Our favourite photographer by a mile is Jade Nott Photography. LGBT Friendly – Parties – Weddings – Civil Partnerships. We’d love to be able to work with you at your wedding, feel free to message us for a quotation.